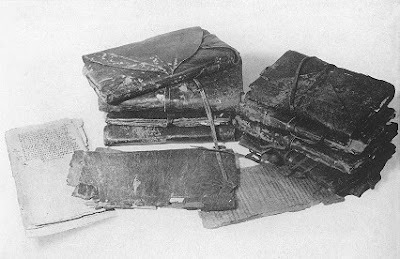 Here is the most common photo of the Nag Hammadi books; I have linked this back to Wikipedia since its copyright is in dispute so anyone who is interested can go there to read about it. The books were just discovered in 1945, so the photograph is not so old. The books, though, are very old, dating from the 3rd or 4th century. There aren't many photos of these books, because they were dismantled for preservation, I believe. View the full Wikipedia article. The content of the books is the primary point of interest for most historians... I, on the other hand, just get annoyed when I google this topic and all I can find is the content! Nothing about the structure! Ah, but I was very fortunate to attend a great workshop where I learned how they were made and have since created my own nice stash. (There are a couple of them for sale in my Etsy shop). Very cool, we have workshops around here but they are always the basic learn coptic, learn casebound, etc. I would love to have something like that workshop around here! Doesn't that horrify you when books are dismantled for conservation and the original bindings are undocumented and lost? I read a lot about it when working for a conservator and some of the major libraries are the culprits. Great to see you are making your own stash, would love to do that workshop. Rhonda, if I could get there I'd take you up on the room and board but Sydney is way too far from you and all the wonderful workshops I read about. I'm working at the moment on cataloguing rare books in our museum collection and I'm seeing so many unsympathetic rebindings of wonderful old books that must once have had interesting bindings. I'm documenting what's left but it's a sad situation. well, carol, it's lucky that you didn't book a trans-global flight for this workshop since it has been canceled. probably due to an insufficient number of people signing up - typical of this area. very frustrating for those who really want to be there. 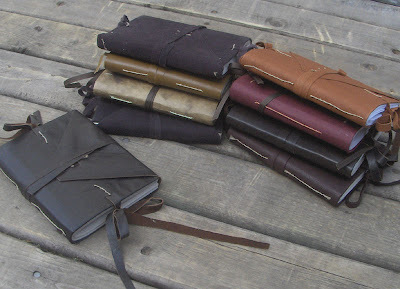 The Archaeology of Medieval Bookbinding by J. A. Szirmai has a pretty detailed explanation about the structure of the Nag Hammadi codices. The book is also great in dissecting other ancient book structures. It's not really a how-to guide as it is a research book, but a lot of information can be gained from it. Not cheap, but you can usually find it from a library loan program.